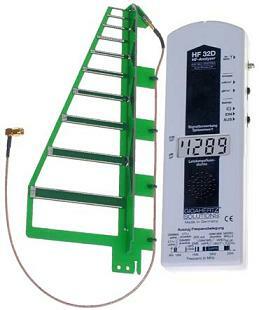 For a quick and competent assessment of microwave/HF exposure between 800 MHz and 2.5 GHz. This range includes mobile/cellular phones, cordless phones, Bluetooth, Wi-Fi, Wi-Max, and computer/broadband wLANs. It has patented directional Yagi logarithmic-periodic antenna (usable to 3.3 GHz), which can either be used mounted to the instrument or hand-held via the cable provided. The HF32D provides measurements from 1-1999 uW/m2 at +/- 6 dB, and features a sounder (tone signal proportional to field strength) for acoustic analysis. Helpful instructions, a standard 9V battery, and a 2-year Warranty included.